There are plenty of practices we can take up to help maintain clean, healthy teeth. Brushing, flossing, and regularly visiting the dentist are among those that first come to mind but those habits aren’t always enough. There are many foods we eat on a regular basis that can be damaging to our teeth. Follow this dental tip of five foods to avoid in order to further protect your teeth. Seeing as ice is just water, it should be fine to eat, right? Not necessarily. While ice is great for chilling beverages, it’s not the best to chew on. The hard, crunchy nature of ice can lead to damage of tooth enamel, cracked teeth, and loosened crowns. Keep it on hand for cooling down your drink on a warm summer day, but avoid actually munching on this frosty beverage chiller. This is another item that most of us think is perfectly fine to eat in any quantity. 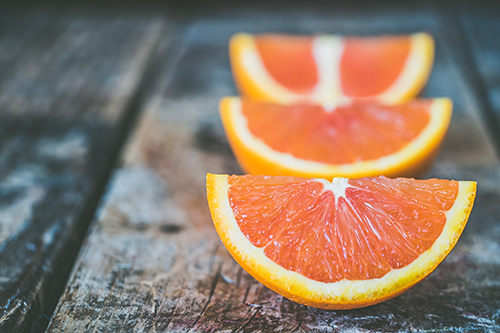 Oranges, lemons, limes, grapefruit, and their juices have all kinds of vitamins and health benefits after all. The acid in these tasty, relatively healthy eats can have a negative impact on your teeth. That acid erodes enamel, which can lead to decay. If you still want to want to enjoy the flavor and health benefits of citrus, eat it in moderation. You can also help keep the acid from damaging your teeth by rinsing with water after eating. This can include candies and even dried fruit, which has higher concentrations of sugar then their fresh counterparts. The reason these foods are so bad for teeth is that the chewy factor means the food can get stuck between your teeth, allowing the sugars to sit around and contribute to decay. Again, these foods can still be enjoyed in moderation. It’s also best to rinse your mouth with water, then brush and floss after eating to remove any excess sticky residue. We all love the satisfying crunch of a potato chip or pretzel. These snacks are high in starch, which gets stuck in teeth. The best way to ensure your teeth don’t keep these crunchy foods stuck between the crevices is to brush and floss extra carefully after eating. Many of the beverages we consume on a regular basis have excess sugars these days. Soda, juices, energy drinks, and coffee with added sugar and flavorings are all culprits here. While water is the best option to ensure excess sugars aren’t sitting on your teeth, you can still enjoy your favorite beverage. Again, moderation is key, and it’s best to sip potentially sugary drinks with a glass of water on the side. The bottom line with enjoying any potentially harmful foods is to eat them in moderation, be sure to follow up with brushing and flossing, and visit your dentist for regular checkups. For those in the Columbus, MO area, it’s best to visit the team at Porter, Singley, and Crane Family Dentistry. They’ll help clean and care for your teeth to the best degree, even if you enjoy a few guilty pleasures in your diet.